Very Good. 288 p. The element is the point at which natural talent meets personal passion. This book identifies a crisis in education and business: whether it's a child bored in class, a disillusioned or misused employee or someone who feels frustrated but can't quite explain why, too many people don't realize what they are capable of achieving. Very Good. 288 p. The element is the point at which natural talent meets personal passion. This book draws on the stories of a range of people-from ex-Beatle Paul McCartney to physicist Richard Feynman, including business leaders and athletes-showing how they came to recognize their unique talents and were able to make a successful living doing what they love. Good. 288 p. The element is the point at which natural talent meets personal passion. This book draws on the stories of a range of people-from ex-Beatle Paul McCartney to physicist Richard Feynman, including business leaders and athletes-showing how they came to recognize their unique talents and were able to make a successful living doing what they love. I highly recommend this book. Very inspiring. It challenges you to recognize and run with your inherent strengths -- the natural abilities you already have. Robinson motivates his readers to evaluate themselves based on nontraditional areas of intelligence - the areas society usually overlooks. Finding this strength, this passion inside of you can change your life, your career, your achievements. This book is especially meaningful for those looking for a career, or people who feel they have so much more to give, but haven't yet found their niche. It's a must read for home-schooling parents seeking to bring out the best in their kids. I believe it is the answer to a wearying global economy. 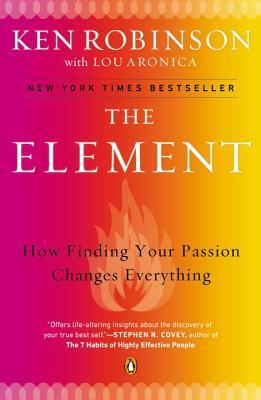 Instead of hunting & chasing after up-and-coming job markets or industries -- instead of pushing yourself to learn job skills in fields you don't care for, and will change anyway -- this book should teach you the power of living in YOUR element, something you both love and excel at. Find it, and people will pay you to do what you love and do best. This book is for educators or artistic people in need of recovery from their regimented lackluster official Western education, not for those trying to find their passion. The first three quarters of the book talks about the blazing success of those of artistic nature who thrived in spite of the one size fits all education. This part could've used some culling. The last quarter of the book looks at why and how the education system missed the mark for those who aren't of the math/science leaning. It also cites a few shining examples of schools that've retooled their curriculum to engage more students. The sad and sorry advice at the end for those plugged into the labor-market in unengaging roles is to engage in your passion in your spare time. I don't know that it's going to be news to anyone and that's usually tougher to accomplish for those loaded with the typical job/house/kids/spouse as it means offloading a great deal of responsibility for serious pursuit.